Alex Siegel has written four series, full of hellish scenarios and diabolical plot twists. 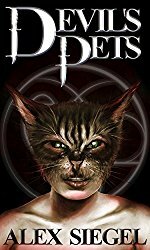 His latest series is called Paranormal Enforcement Administration, which begins with The Devil’s Pets. Alex is a computer programmer by day and a passionate, even obsessive, writer by night. He has published 24 titles with an online fandom clamoring for more. He lives in Chicago with his wife and triplet teenage boys.